For as long as she can remember, Debra Russell has used photography to chronicle life moments and milestones. 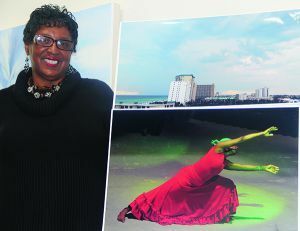 However, the Pensacola State College student never imagined some of her photos would be part of a nationwide exhibit. Russell is one of 10 female veterans whose artwork and photography will be displayed in Department of Veterans Affairs Medical Centers across the U.S. during March. A former U.S. Navy service member, Russell was one of about 400 veterans to submit artwork to be considered for the exhibition which coincides with Women’s History Month. Russell who served in the Navy from 1985-1997 said she was divinely inspired to take a photo of the waterspout – even as it was disintegrating. “I happened to be on the seventh floor of a complex and had a perfect view of that waterspout and its eye. I just felt divine direction; God had taken my hand and this waterspout revealed to me how to weather the storms of life,” she remembered, adding after being medically discharged from the Navy, she didn’t know what to do next. Eventually, Russell joined a veterans’ photography group where she rediscovered her calling. Veterans Administration officials said the public deserves an opportunity to get to know the women who serve in the armed forces. “It is our hope that this exhibit will provide insight into the diverse experiences of women who serve our country, through their respective lenses,” said Director of VA’s Center for Women Veterans Kayla Williams, in a prepared statement. North Las Vegas VA Medical Center. Russell said she was told her photos would be displayed close to Pensacola – so she and her family will visit New Orleans. Following the exhibition, the artwork will be donated to the VA centers. “I also have photos I took of a mural in the New Orleans bus station many years ago and I plan to donate those to the medical center as well,” she added. The other veteran-artists are Victoria R. Bryers, U.S. Coast Guard; Pamela Corwin, U.S. Army; Amy Forsythe, U.S. Marine Corps; Natalie Lopez, U.S. Air Force; Cara Myhre, U.S. Army; Deveon Sudduth, U.S. Army; Laura Taylor, U.S, Navy; Stacey Thompson, U.S. Marine Corps; and Lindsay Zike, U.S. Navy. Russell has a long history with Pensacola State – she already earned an associate’s degree in photography and multimedia from Pensacola Junior College. Today, she is working on her bachelor’s degree in graphic design. A certified mental health counselor, she plans to eventually use photography as an alternate therapy for her clients. With 5,000 to 7,000 photos in her lifetime collection, Russell has captured some of history’s most extraordinary moments – including photos of the late Coretta Scott King, Jesse Jackson and other civil rights icons at commemorative Bloody Sunday marches in Selma, Alabama. Her work also has been published in Out Front magazine and she has interned at the Pensacola News Journal and served as The Corsair’s photo editor. “Over the years, I’ve taken many photos because I really enjoyed photography. I always wanted to be a photojournalist but I couldn’t afford it. I was a single mother and I had a kid,” she said. The exhibition is not the only time Russell has received national accolades. During her military career, she was an instructor and financial counselor. In 1996, she even received a Presidential Citation Award from President Bill Clinton for heading up one of the first electronic tax filing centers in the United States. The Women Veterans Art Exhibit initiative is the result of a collaboration between the Center for Women Veterans, Veteran Artist Program, First Data, and the Veterans Canteen Service. The partnerships allow for the temporary displays to be shown in these facilities at no cost to Veterans Administration. In addition to Women’s History Month, March is the 100-year anniversary of women officially enlisting in the regular U.S. military with full military rank and equal pay.